Mould constitutes a variety of fungi that can grow on surfaces around the home. In addition to being unattractive, mould can also be a health hazard. Some varieties are toxic, particularly to those with allergies. Young children can be especially susceptible to the effects of exposure to toxic mould, leading to respiratory and neurological issues. It is for this reason that mould removal is vital, particularly in damp, poorly ventilated areas such as a bathroom or kitchen. There are several options available for mould removal, though mould on walls is harder to deal with. One option is HG Mould Spray, one of the fastest acting on the market. 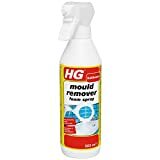 HG’s spray can even be used on old, dried out mould if left longer, which is especially useful for mould in the bathroom. The results are long lasting, but not permanent so continual use is required. HG Mould Spray contains some strong chemicals, these chemicals are also highly irritant and corrosive, and should only be used while wearing hand and eye protection in a well-ventilated area. Another option for both the kitchen and the bathroom is Dettol Complete Clean Mould and Mildew Remover. 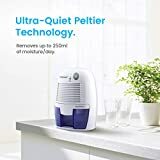 Dettol has retained the easy to use spray bottle and, like Dettol’s other products, the spray kills 99.99% of bacteria as well as removing mould with powerful bleach and is very fast acting. Dettol can be used on a variety of surfaces, and is budget-friendly. However, the product is far from a permanent solution, and has also been known to discolour paint. As such, it is advisable that the product be used only on mould in the bathroom or kitchen. Additionally, the chemicals in the spray have a strong smell and may also cause skin or throat irritation. It is advisable that the product be used with care, in well-ventilated areas. A third option for mould removal is Polycell Mould Cleaner, which permanently prevents regrowth as well as removing existing mould. Polycell’s cleaner has very little odour and is highly versatile, working on a variety of surfaces. It is also highly economical. This product is not as fast acting as the other two, and needs to be left longer. For tougher mould several applications might be required. The product contains strong chemicals and should be handled with gloves. As a means of reducing further mould growth it is worth investing in a dehumidifier. As an anti mould technique it is not entirely fool proof, however it will reduce the spread of mould, making it easier to manage. The majority of mould removers contain bleach and can damage and discolour paint, so it is advisable to seek professional assistance in the matter or invest in anti-mould paint. To prevent mould on walls there are several varieties of anti mould paint available, which are ideal for preventing further growth on walls. For excessive or rapid mould growth it is recommended that you contact the local government environmental agency, as this suggests a bigger problem.